This stunning Amish Sedona Hall Seat with Hidden Gun Cabinet is a stylish substitute for a steel gun safe. 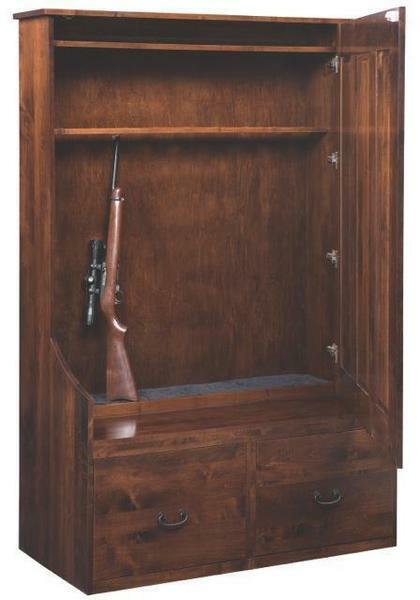 While the wood frame may not be as secure as a steel gun safe, the hidden compartment allows you to store your firearm collection in plain site without anyone knowing, This feature increases the security of your guns and provides quick access to them without keeping them out on display or locked away and hard to get too. The unique magnetic rev-a-lock used to keep the secret compartment locked can only be opened with a magnetic key by pressing it against a specific spot on the wood to engage the lock on the other side. Only you will know where and how to use this unique locking system, giving you complete control over who has access to your fireaems. Store up to nine rifles on the hidden gun rack concealed behind the hall seat back that acts as a secret door. Four hooks are standard on this secret door back panel and are great for hanging your coats in the entry way to your home, as well as a way to conceal the secondary purpose of this one-of-a-kind handcrafted hall seat. Also, the bottom drawers under the bench are a great extra storage feature that can store your ammo, hand guns, and firearm accessories. Create a custom look to match your home and style by choosing the wood and finish type. Your custom hall seat gun cabinet will be handcrafted to order for your personal home by our talented Amish woodworkers, ensuring that the finished product will be an heirloom quality piece of American craftsmanship that you will be proud to own as part of your home furniture collection. Contact our friendly Amish furniture consultants for additional information or custom ordering assistance on this unique handcrafted Sedona Hall Seat with Hidden Gun Cabinet.